After I made a pirate outfit for Kerithian to express my delight and gratitude for Alunaria’s generous gift of a Cap’n Crackers, a few of my other characters wanted to have pirate parrot outfits, too. I never quite caught on to the Pepe mania during Warlords. Nevertheless, I had to find out if it was possible to have a bird on one’s shoulder and a bird on one’s head. Because I wasn’t sure when I’d manage to get Kiralaira out to Zandalar, I watched the AH carefully for awhile to be able to acquire a set of Kul Tiras warglaives that could be used at level 110. Cap’n Crackers suggested that I shouldn’t wait any longer to make a kit with them. I didn’t go all out and make a complete collection with outfits for all the armor types because I haven’t a) leveled my Dwarf Paladin in Kul Tiras so I can use that armor style for the plate set or b) got a Kul Tiran Shaman to wear the mail set… yet. Outfits to wear with the Safari Hat. Desire to look ruggedly attractive: required. 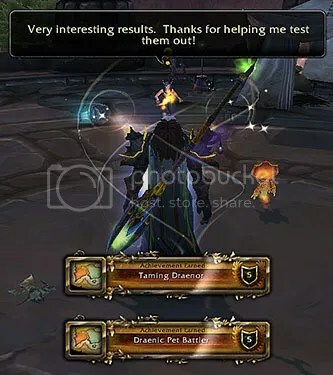 Actually being a dedicated Pet Battling alt: recommended, but not required. A more complete version of the Veteran Armor is avaliable in plate, from quest rewards that were originally mail, but were converted to plate in Patch 7.0. The pith helmet motif is also associated with explorers (and archaeologists, and paleontologists); any of these outfits would also work quite nicely with the Tabard of the Explorer. Since the last Battle Pet Bonus Week, my Hunter has been methodically leveling all the remaining level 1 pets in my favorites list. It feels kind of creepy to be camping out on Ashlei’s hill, because of how she’s just a kid and all, but her two-pet team makes her the easiest to reliably beat — and I’m too lazy to travel around and battle more than one trainer per day. Anyhow, pet-battling having gotten Ketura to level 102, it was time to go get the Artifacts for her other specs. 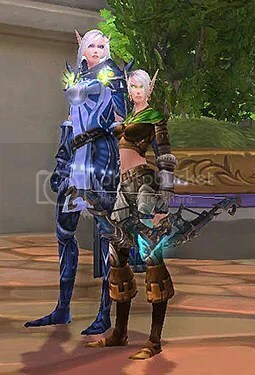 Knowing that the Marksmanship weapon is Alleria Windrunner’s bow, I hoped that I wouldn’t be taking it from her dead body after having failed to rescue her. Fortunately, that was not what happened. But if she is still alive, why would she have left the bow behind? 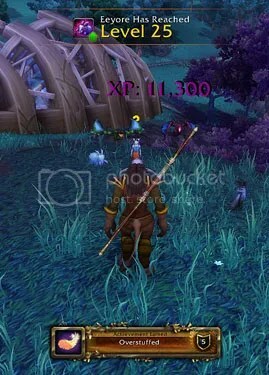 It didn’t seem quite right to claim Thas’dorah as a Tauren; that bow rightfully belongs to the children of the Sunwell. So I used the Orb of the Sin’dorei before I picked it up. I guess my camera angle was bad right at the moment when I clicked on Thas’dorah, because this is the best screenshot I got of the triumphal moment. I didn’t feel persnickety enough about getting a really good screenshot to abandon the quest and do everything over again, though. I had really struggled to get through the scenario. I’d died several times. Partly that was because I didn’t have a very good ranged weapon equipped — it was the reward from the Broken Shore scenario, and I’d forgotten that I’d bought a better one from the Trueshot Lodge quartermaster after I picked up my first Artifact. I also hadn’t played as Marksmanship enough to have figured out the synergy of the abilities very well yet. Furthermore, I’d gotten DC’d halfway through and had to start over from the beginning once already. I hope that my future actions do not cause Vereesa to decide that her trust in me, and her decision to allow her sister’s bow to be taken by a member of the Horde, were foolish. 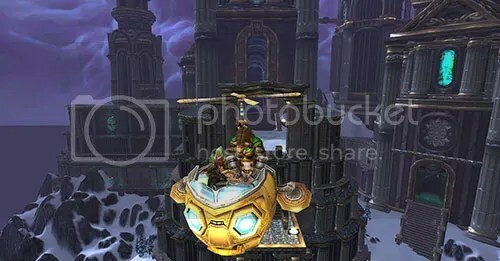 I enjoyed the subsequent visit to Mimiron’s workshop in Ulduar — and getting to ride in Mimiron’s Head. The master of beasts part seems a bit tacked-on, though — it makes sense in the same sort of sideways way that the Fist of Ra-den being the weapon for Elemental Shaman rather than Mistweaver Monks does. I’d farmed the Rifle of the Platinum Guard to Mog over Titanstrike, but I like its appearance better than I thought I did from just seeing the previews on Wowhead during the beta. So I guess I won’t be Mogging over it right away. For the time being, I’ll also just leave Hati as Hati, rather than getting the item that lets you change Hati’s appearance to match your regular pet. My Demon Hunter was very very close to 102. She had some skinning & leatherworking quests, so I went out to Azsuna and farmed bears and hippogryphs. I thought that perhaps turning in those quests would tick her over; as it happened, just the farming did the trick. Even though I don’t plan to try to tank for groups, or even to play solo as Vengeance very much, I’d decided to get the Artifact weapon for that spec to see the story and to honor the memory of a race that had so valiantly resisted the Legion. 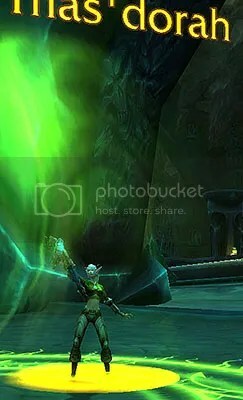 After having gone to Niskara for the Marksmanship Hunter weapon, I wondered if perhaps the Vengeance Demon Hunter would go there, too — if maybe Niskara was a fragment of the Aldrachi world. 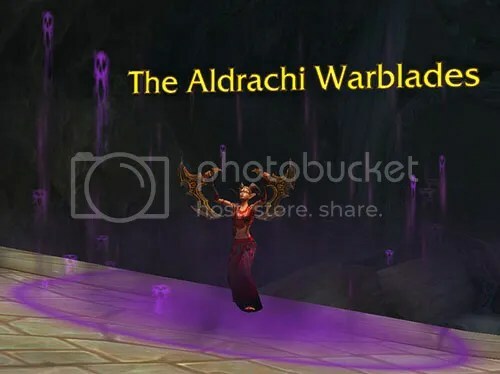 But I was disappointed in this; the questline did not reveal anything more about who the Aldrachi were; the Vengeance Demon Hunter goes to the Broken Shore. Along the way to the final boss fight of the scenario, I saw some dead Argent Crusade types. Hmm, I guess that location must also be where the Retribution Paladin questline goes. Like Mardum, Dreadscar Rift, and Netherlight Temple — and the Remains of Xandros, where we battled Mongrethod at the end of the Talador storyline in Warlords — Niskara is a fragment of a world destroyed by the Burning Legion. These Legion zones are all so tiny — about the size of the Broken Shore. The more of these miniscule shreds of worlds I visit, the more chilling the power of the Legion becomes — and the more vital that Azeroth’s people save her. And collected all of the Draenor wolf puppies. Although I still have many pets that are not level 25 and many pets that are not rare quality, I think I’ll take a rest from Pet Battling (except when it’s Pet Battle Bonus XP Week) and work on one of my other alts’ Warlords goals. What happened to my battle pets? A few days ago, I opened my pet journal, reordered it to sort by level instead of by name (as I always do), and noticed that some of my battle pets seemed to be missing. 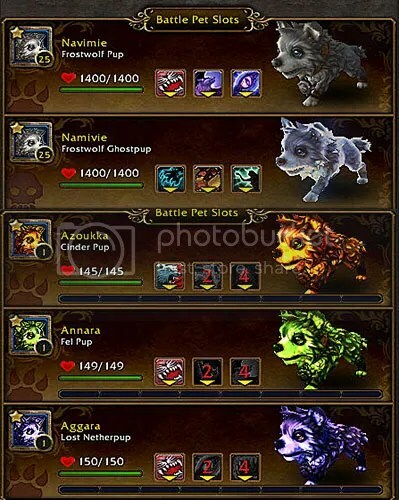 Scrolling down the list, I found the missing pets with the pets that cannot battle. They were greyed out and, when I selected them, unsummonable. Have any of you been experiencing this with your battle pets recently, too? Any ideas what’s going on here? I thought that maybe I had too many pets favorited, as I’d recently promoted several more pets to Favorite status, but de-favoriting some of those pets didn’t restore the greyed out ones to activity. I’ve submitted a bug report about it, because I am really puzzled about what could have triggered it and I have no idea how to fix it. Update (Friday night): Looking at my pet journal again just now, I discovered that all of my disabled pets are are not tradeable, Unique, and from the Blizzard Store (except for the Dread Raven Hatchling, which is from the Warlords deluxe edition)… but I have pets that fit all of those categories that are still active, too. Update 2 (Saturday night): Well, whatever the bug was, I guess it got fixed. Apparently it affected my mount list, too, because the first character I logged in with today had mail from Mei Francis containing all my mounts from the Blizzard Store, plus the Dread Raven mount. (I had been puzzled by one of my mount macros failing last week, but it only happened once, so I hadn’t investigated the problem further.) When I then checked my pet list, my disabled pets were all restored to activity. 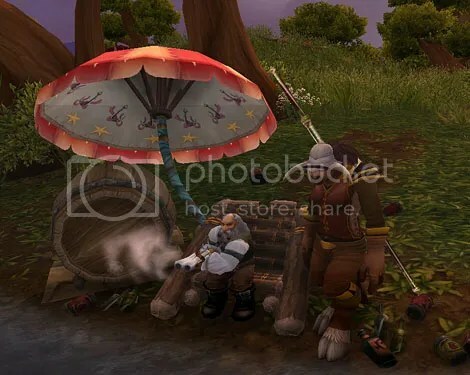 When at length the Peak of Serenity dailies had gotten her to level 96, the Brewmaster-Bagmaker Monk took the Timeless Isle portal to Draenor and set about establishing her Garrison. She specifically collected the followers that she would need to support her professions — Ka’la the Leatherworker, Pleasure Bot 8000 the Tailor, Shadow Hunter Rala the Herbalist, and Dark Ranger Velonara the Skinner — and built the appropriate buildings. She’s mostly ignoring the rest of the followers and missions game. I also decided to build her a Mage Tower for convenient travel to Nagrand for trapping. Between the quests to establish outposts to get the flight points, the quests to get the followers she wanted, and a few quests dealing with Ogres to collect Waystones, she soon found herself halfway through level 98. She wasn’t always a Brewmaster-Bagmaker, though. 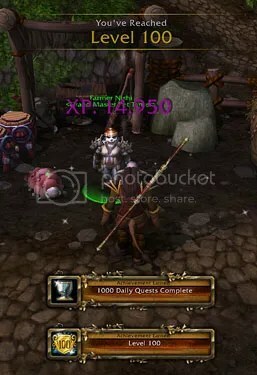 My secondary Monk gained most of the XP for her first 60 levels as a Pet Battler. Once she reached Outland, however, she started doing more and more questing and more and more dungeon healing and less and less Pet Battling. Eventually she decided that she wanted to try out Brewmastering (though only for solo play). 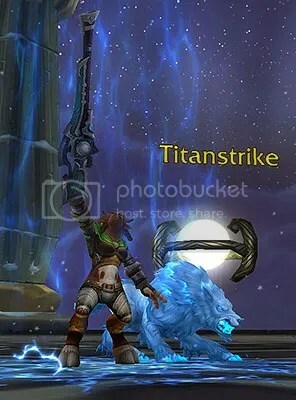 After unsuccessfully lobbying the Underpowered Death Knight to take up Pet Battling, she eventually handed over the Pet Battling leashes to my Hunter. Now I have 6 level 100 charaters, with 10 more active alts still in the leveling queue.